English armies of our period were composed primarily of two types of troops: archers and men-at-arms. Other types appeared from time to time but were always in the minority. While proportions of troops varied throughout the Hundred Years War, in general the ratio of archers to other troops rose as the war went on. In 1334 (when the first reference to a mounted archer appears) the ratio of archers to men-at-arms was 1 to 1. Later in Edward III’s reign, the ratio was usually 2 to 1. By the early fifteenth century, it was up to 3 to 1, as specified by Henry V’s indenture of 1415. Actual proportions in the field were often higher. The extra archers beyond those called for in indentures came from specially raised bodies of “army archers” and the use of town militias from garrisoned French towns. English armies were not large. The largest of the period, raised in 1347 by Edward III to lay siege to Calais, consisted of just over 32,000 men. Just over 20,000 of them were archers, about 1/5 mounted. Edward’s recruiting methods for that army were unpopular, however, and thereafter no army exceeded 10,000 to 12,000 men. Available information about the organization of English armies is a little vague. The commander of a body of men was a captain, whether he was noble or common, and regardless of the number of troops. Men were often arranged into 20s, 100s, and 1000s. Under this scheme 19 men were commanded by the twentieth, the vintenar. Five of these units were commanded by a centenar. Such units were formed at enlistment. At an assembly point, such as a regional headquarters or a port of embarkation, the 20s and 100s could be amalgamated into 1000s. How retainers and retinues fit into this scheme is not clear. Once the army was gathered, the troops were grouped into three “battles”: the vanward, the mainward, and the rearward. On the march, the van and the flanks were screened by detachments of mounted archers and men-at-arms. When drawn up for an engagement, the army could deploy in a linear fashion, and fight with all three battles simultaneously, or in a columnar fashion, and fight with each battle sequentially. Columns were favored for offensive operations, the depth of formation providing mass at the point of contact and offering a greater chance of achieving a decisive penetration of an enemy line. The line formation covered considerable frontage and was difficult to outflank, especially when anchored, as the English were wont to do, in difficult or impassable terrain. The English favored finding a good defensive location, deploying the battles in line, and waiting for the enemy to come to them. But pitched battles were something the English avoided for most of the Hundred Years War. Theirs was a different strategy. Rather than risk all in a decisive engagement, they preferred the strategy of chevauchée, a looting, pillaging, destructive raiding style of warfare designed to demonstrate that the French king could not protect his subjects. It was no coincidence that such a strategy filled English coffers and made rich men of successful soldiers. 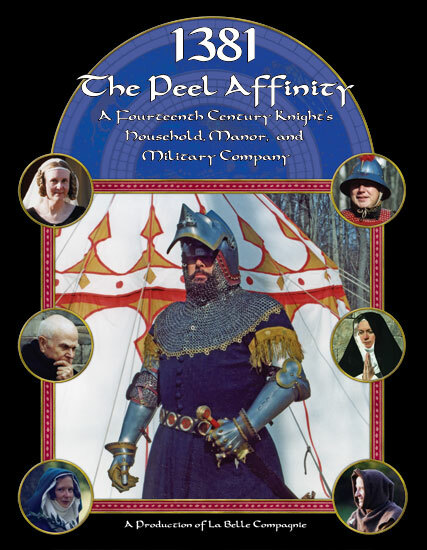 Sir Geoffrey’s military company is intended to represent typical English troops of the Hundred Years War. The Company is built on a core of armored men comprising a knight commander (Sir Geoffrey) and several other men-at-arms. However, the bulk of his troops are archers of one kind or another. If Sir Geoffrey is participating in a chevauchée, his archers will all be mounted, but for other kinds of military expeditions he may have a mixture of mounted and foot archers. The bulk of Sir Geoffrey’s soldiers are retainers and tenants from his manors. These men wear his livery and are equipped at his expense. He does this to ensure that they have good, solid military equipment, including armor, because it makes good military sense to have protected soldiers. He also wants his company to look as impressive as possible, something considered even more important in the Middle Ages than it is today. Soldiers were also drawn from among the servants. Sir Geoffrey, like most lords of the time, expects his male servants to be capable of taking up arms at need, so he often includes a varlet or some other servant on the list of archers he presents to his employer. In practice, such an “archer” would likely spend most of his time on the same types of domestic duties as he would perform at home — but he will be ready to be called upon when a military requirement arises. Other archers in the array include men contracted by indenture for the specific campaign or purpose. The equipment of such men is much more variable and only some of them choose to wear Sir Geoffrey’s livery. However a man comes onto Sir Geoffrey’s list of soldiers, that man must be paid. Pay rates vary by social rank, the type of duty, and agreed-upon terms. Sir Geoffrey’s men do not consider themselves mercenaries, men who fight for no master; they are just soldiers, and soldiers get paid (usually late). But the real lure of military service is the chance for loot and ransom. A lucky soldier can be set up for life by the proceeds from a single lucrative battle.